Windhoek’s first recycling hub which offers a central point where residents can drop off a variety of recyclables as well as correctly dispose of other items, was launched in Windhoek, recently. The Dagbreek school for the Intellectually Impaired, winner of the Recycle Namibia Forum’s (RNF) Annual Schools Recycling Competition over the past few years, was the first choice for the RNF as a ‘one stop’ collection point in Windhoek. Anita Witt, RNF’s Coordinator said that apart from the usual recyclables such as paper, plastic, glass and cans, Dagbreek now offers collection points for e-waste, as well as used household batteries. “The school and its learners are also very involved with, and are supported in their efforts by their local communities, with regular clean-ups hosted in the suburbs surrounding the school. It has also become evident that residents of Windhoek are keen to do the right thing, thus offering a one-stop solution for a variety of items at Dagbreek will be well received by residents in the Klein Windhoek / Avis and Ludwigsdorf areas,” Witt said. Witt added that the school has made quite an impact with their eco-friendly, green activities and initiatives, which includes reusing recyclable items in their arts, crafts and woodwork projects, as well as gardening, composting, farming earthworms and aquaponics. “Scrap Salvage wants to assist all companies with a cleaner and brighter Namibia. We have committed to assisting Dagbreek with their Go Green policies, by donating a skip to the school. All proceeds of the e-waste will be donated back to the School to show our support with cleaning up Namibia,” said Philip Barnard, Financial Manager at Scrap Salvage Namibia. Furthermore, the household battery collection bin was sponsored by Varta Consumer Batteries Namibia. Harald Bartsch from Varta indicated that the company decided to also place a bin at Dagbreek. “We would like to see this school as a strategic partner for us and the RNF, as they are very well known for their environmental efforts. Dagbreek is willing to contribute towards the protection of our environment and nature and we absolutely love this positive attitude. Their hearts are in the right place and we want to support that,” Bartsch noted. All electrical appliances, including household items such as kettles, washing machines, fridges etc. all resort under e-waste and can be deposited at skip at Dagbreek. 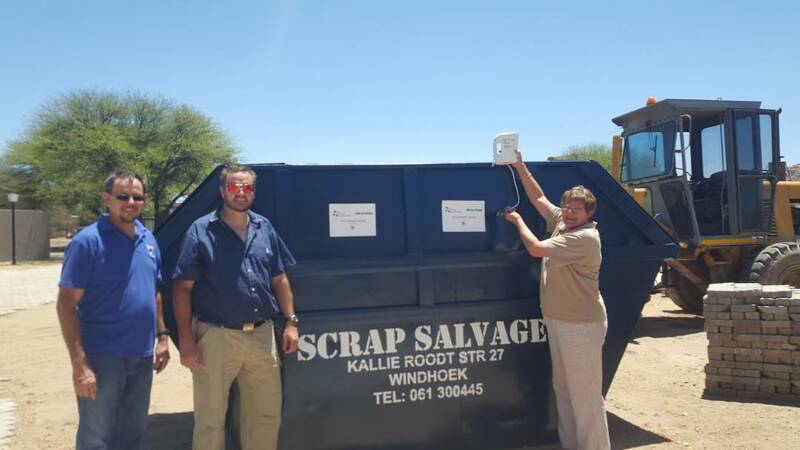 Other partners in the project include Rent-A-Drum with the schools recycling project (collection and weighing of the recyclables) and the City of Windhoek’s Waste Management Division, with assisting in disposing of the used batteries at the hazardous waste section at Kupferberg landfill. Estelle Hein, Public Participation Officer at the Solid Waste Division of the City of Windhoek indicated that providing a central point for the collection of recyclables plus other waste, will be of benefit to residents, as they then do not need to drive to the landfill. “We are working towards zero waste to landfill, thus providing an opportunity to responsibly dispose of products which may be harmful to the environment, will contribute greatly to our efforts,” Hein added. It is envisaged to expand the project with the implementation of a collection point for used fluorescent light bulbs during the course of 2018.